The shoulder is a complex joint which can move freely and painlessly, as long as all its parts are in good working order. 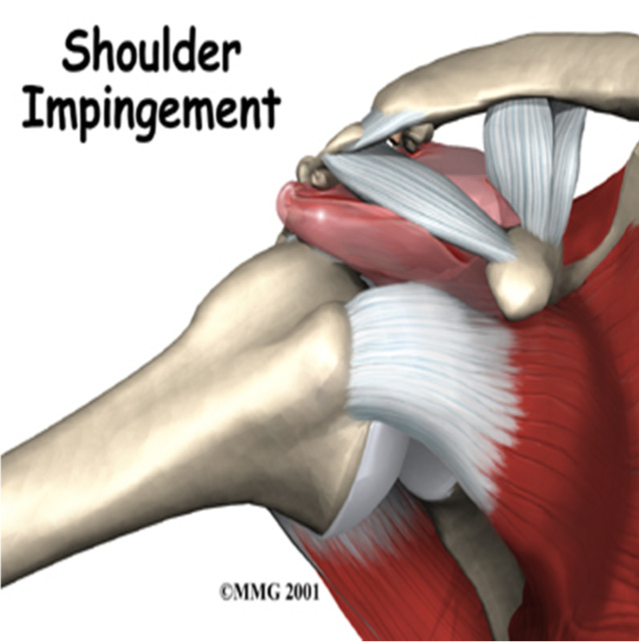 Shoulder impingement syndrome is caused when there is insufficient room between the acromion and the supraspinatus tendon (part of the rotator cuff) when the arm is elevated. 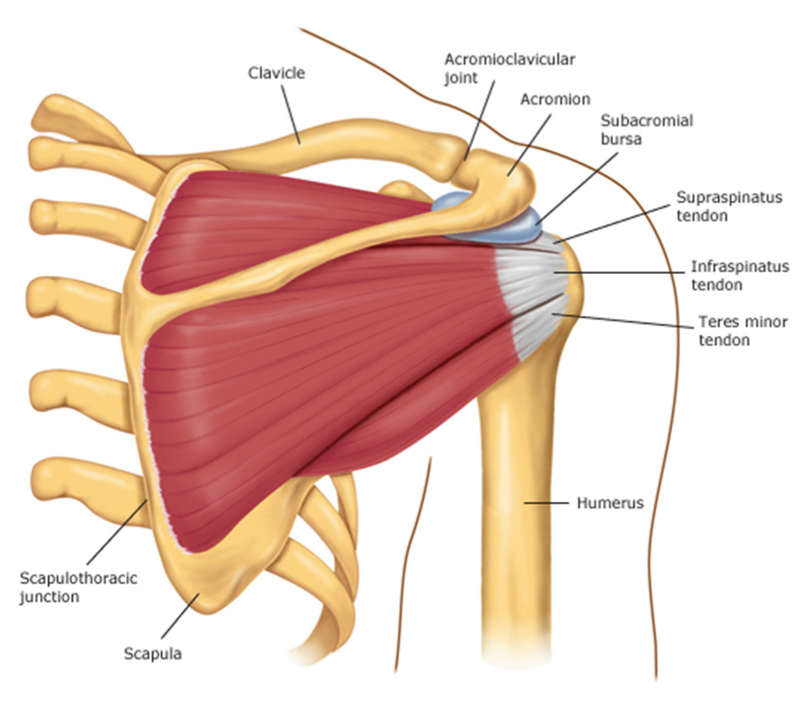 There is a small space between the cuff and the acromion which is filled with a lubricated sac called the subacromial bursa. The bursa functions as a cushion to prevent the acromion and the rotator cuff tendons from grinding against each other. It is normal to have some degree of rubbing or pinching of the tendons and bursa. Overuse of the shoulder in an elevated position can cause the impingement to become a problem and can lead to ongoing pain or damage to the rotator cuff tendons. pain when lifting and rotating the arm. The diagnosis is usually made on the basis of a physical examination and medical history. The surgeon may require an x-ray to check for bone spurs, calcific deposits or abnormal acromion. Because x-rays do not show the soft tissues of your shoulder, an MRI scan may also be performed if the surgeon suspects any tears to the rotator cuff. Conservative non-surgical treatment can often be sufficient. Physiotherapy – This can assist with increased movement in the joint and minimize the loss of muscle bulk on the affected arm. Improvement in the strength and coordination of the rotator cuff and shoulder blade muscles can allow easier movement under the acromion. Anti-inflammatory Medications – These medications can be helpful in reducing swelling or inflammation in the shoulder joint, thereby reducing pain. Injections – If rest, medications and physiotherapy do not relieve your pain, an injection of local anaesthetic and cortisone may be helpful because they are both therapeutic and they can help the surgeon differentiate impingement from other problems. Cortisone injections can be used to reduce inflammation in the shoulder joint, which in turn may help decrease pain and allow for further physiotherapy. The effects of cortisone are temporary, but may provide some months of relief. If injections are recommended, they will usually be administered by the surgeon under ultrasound imaging. A maximum of 2 to 3 injections with 6 weeks between injections is allowable. When non-surgical treatment does not relieve pain, your surgeon may recommend surgery. 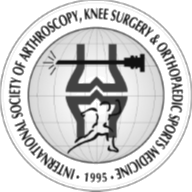 The aim of the surgery is to increase the space between the rotator cuff and the acromion, and this is called an arthroscopic subacromial decompression. 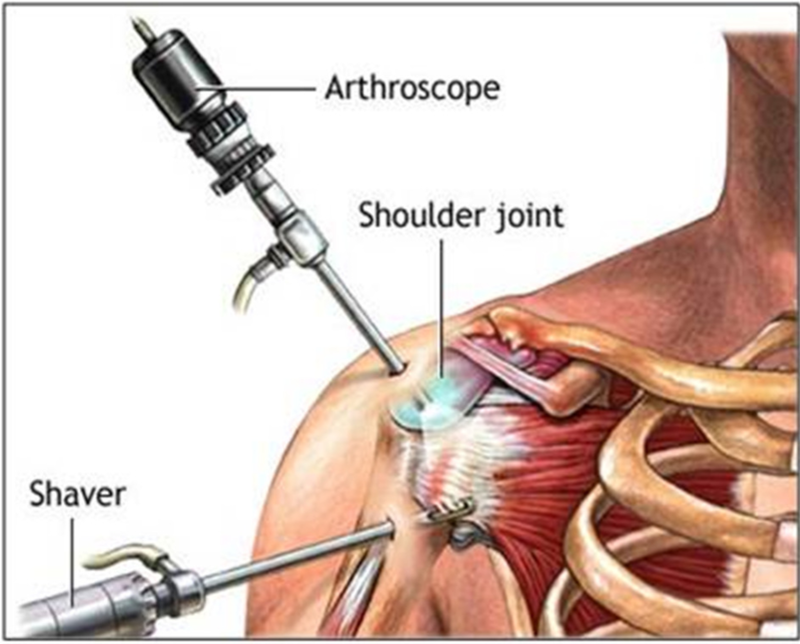 The surgeon will make a small incision to allow an arthroscope to be inserted into the shoulder joint. A small part of the acromion will usually be removed, together with any bony spurs that are present, to give the rotator cuff tendons more space to glide smoothly within the shoulder joint. The surgeon may also treat other conditions present in the shoulder at the time of surgery. These can include arthritis between the clavicle (collarbone) and the acromion; inflammation of the biceps tendon (biceps tendonitis), or a rotator cuff tear. After surgery, your arm will be in a sling for 24 hours for comfort only. needs will be provided for you. This will include exercises to regain range of motion of the shoulder and strength of the arm. Any sustained, repetitive overhead activities or heavy lifting should be avoided for the first 3 months. You may be able to return to work after one to two weeks if you have a sedentary job. You will need slightly longer if your job involves lifting or manual work, possibly up to 12 weeks. Response to surgery is usually aligned to the level of pain relief obtained by pre-operative injections. Overall there is an 85-90% chance of improving pain with successful surgery. Usually the shoulder will take 8 to 12 weeks to stabilise after surgery and thereafter results will be known. Workcover patients may take longer to recover and outcomes are more unpredictable.